A Soyuz-2 rocket carrying the MetOp-A weather satellite stands poised to launch from Baikonur Cosmodrome on Oct. 17, 2006. The attempt was scrubbed secons before liftoff. DARMSTADT,Germany -- The launch of Europe's MetOp-A weather satellite was delayed for thesecond straight day Oct. 18 because of high winds above the Baikonur Cosmodromelaunch site in Kazakhstan, launch officials said. A new attempt will bemade on Oct. 19. It was thefifth straight scrub of the launch since July. 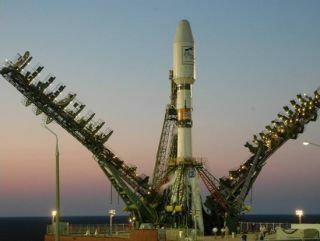 Three attempts to launch MetOp-Aaboard a new version of Russia's venerable Soyuz rocket were scrapped thatmonth because of sensor false alarms on the new, all-digital networkinstalled at the launch installation and the rocket. Launchofficials spent three months testing the ground installation and itsconnections to the modified Soyuz, called the Soyuz 2-1a [image],but an Oct. 17 attempt was abortedone minute and 10 seconds before launch when a ground sensor signaled lowpressure in the rocket's upper-stage fuel tank. Officialsfrom Starsem, the French-Russian company that manages Soyuz commerciallaunches, said Oct. 18 that the sensor warning was erroneous; there had been noproblem with the upper stage's fuel pressure. This new,digital version of Soyuz was first tested at northern Russia's PlesetskCosmodrome in November 2004 and worked without incident. The same system isbeing used for the first time at the Baikonur site for the Metop-1 launch. The4,085-kilogram MetOp-A will be Europe's first polar-orbiting meteorologicalsatellite and also will inaugurate a long-term cooperation with U.S. civil andmilitary authorities on weather monitoring. The U.S. National Oceanic andAtmospheric Administration (NOAA) and the U.S. Defense Department are partnersin the future U.S. polar-orbiting weather satellite system and are sharingresponsibility for a trans-Atlantic polar-orbiting system with Europe's EUMETSATorganization, headquartered here. Threeidentical MetOp satellites are being built by a large contracting team led byAstrium of Europe. They will be launched at four-year intervals. Eachcarries 11 observing instruments. The MetOp program,financed principally by EUMETSAT with a 25 percent contribution by the EuropeanSpace Agency, is budgeted at 2.4 billion euros ($3billion).